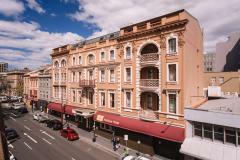 A charming heritage hotel built in 1834 fully restored and refurbished with Victorian style mahogany furniture. Ideally located in the heart of Hobart's CBD within easy walking distance to shops, restaurants, Salamanca Market and Constitution Dock. Facilities include 71 spacious heritage style guest rooms and suites, Restaurant 1834, Lobby Bar, full size billiard table, wood fires in public areas and a variety of function and meeting rooms.